Filmmakers Rian Brown-Orso and Geoff Pingree have been active at PRO Hub looking to secure international sales and explore French distribution possibilities for The Foreigner’s Home, which seeks to capture cinematically the essence of Nobel Prize-winning author Toni Morrison and her belief in the transformative effect of art. Using footage of her shot in Paris in 2006, as well as interview, animation, archive and stills, the film illustrates the writer’s ideas on race, identity and what it means to be a foreigner. The Foreigner's Home world-premiered 26 January in IFFR Perspectives. The filmmakers were introduced to Morrison by her New York neighbour (and their friend) Jonathan Demme. She was at a loss as to what to do with the 2006 footage (shot by her son) from an exhibition that she curated at the Louvre, also entitled 'The Foreigner's Home'. She agreed to their involvement but was reluctant to be interviewed on camera, but after seeing an initial cut she relented. "What flipped it was that she realised we weren’t interested in worshipping her," says Pingree. "[We recorded] her ideas and vision about the state of the world and how we treat other people – this is not a story, this not a narrative, this is a lament, a warning and a challenge." 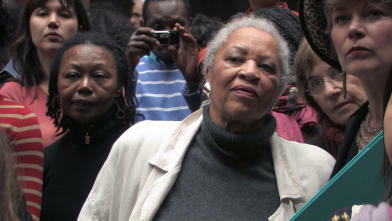 In 2006 Nobel Prize-winning author Toni Morrison curated an exhibition in the Louvre based around Géricault’s painting The Raft of the Medusa. She argued for the contemporary relevance of this work through artists and ‘outsiders’ who have been displaced. She finds out that, during the following 10 years, the problem has not only become larger, but also more urgent. Animation is key to the film as emblematic boat and bird motifs are repeated. "Toni is a writer, so it is as if the pencil is lifting off her page and into the boat and the bird," comments Brown-Orso. "The boat is the people left to die, the migrants, the slave ships …[The drawings] are very ghostlike. They create a kind of history of memory and reflection - like a palimpsest. They are hand-drawn on top of images of the migrant, images of Martin Luther King and Nina Simone… We wanted to hold the meaning of her words through these sensual drawings." The final screening is Sunday 13.00 in Kino 2.